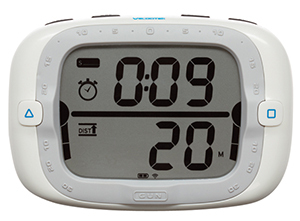 ProStart is a standalone sail racing timer combined with an instrument that displays your heading and GPS speed. What Functions Do You Want? Knotmeter: Measures a boat’s speed, and knotlog records distance traveled through the water. Both are basic navigation tools and provide information of general interest. Virtually all boaters want to know how fast the boat is going. Sailors want to trim sails to optimize boat speed, and the powerboaters want to optimize towing, cruising or trolling speed, or just know how quickly they are getting somewhere. Depth sounder: Indicates how deep the water is so you can avoid running aground, can set your anchor with proper scope, and can navigate more accurately. Transducers, similar to those of a fishfinder, gather depth and speed information and pass it to connected displays. Wind instrument: Displays wind angle and speed in the cockpit or at the base of the mast. This information allows you to sail as fast and efficiently as possible, and helps you know when to reduce sail. Wind instruments are also helpful for night sailing, when watching the water for waves and gusts is impossible. They are occasionally found on powerboats, especially those that cruise or perform race committee duties. Wind instruments, when connected to speed, depth, compass and GPS data, can calculate an array of useful data: true and apparent wind, velocity made good, closehauled wind angles and tacking angles. Instrument packages are a simplified way to buy three common sailboat instruments: a knotlog, depth sounder and wind instrument. Repeater: As the name suggests, a repeater mimics information that is being transmitted on the data network, and can occasionally create new information by combining data. For example, true wind angle can be computed from boat speed, wind speed, and apparent wind angle. Repeaters do not have transducers; they merely process data measured by other instruments. Compass: Digital and/or analog readout of a fluxgate compass. 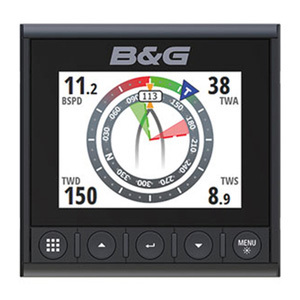 B&G’s Triton² Digital Display is a multi-purpose sailing instrument with dedicated sailing features. Speed data: Speed over the ground (SOG) allows you to see the effect of current, which may be substantial. Connected to a GPS, your instruments can tell both how fast you’re going through the water and your SOG. Trip: Just like your car’s Trip Odometer. Good for determining your cruising speed and fuel consumption. Water Temperature: Very useful for anglers, cruisers wondering if they have entered the Gulf Stream, or divers. True Wind: The wind you feel when stationary is the true wind. Apparent wind is a vector that combines your boat’s speed with the true wind. True wind is useful for showing wind shifts, how high a sailboat is pointing and tacking angles. Velocity Made Good (VMG): Shows your true speed toward a waypoint. If you’re heading directly at the destination, your SOG and VMG will match, but when traveling off-course your VMG will be lower. Especially important for sailors going upwind. For example, if you point a little lower, but travel through the water faster, your VMG may go up or down. Shallow water/Deep water: Alarms that show decreasing or increasing depth are very important safety features to keep from running aground, or show if your anchor is dragging. Timer: Countdown or count-up timers provide a great way for racing sailors to keep track of their start time, with big letters visible anywhere in the cockpit. 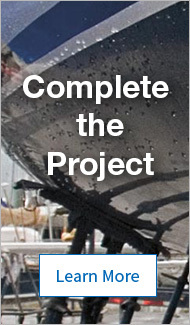 Single-purpose Dedicated Instrument or NMEA 2000 Network Instrument That Shows Data From Any Sensors? The instruments we described above display one sort of data only. A knotmeter, for example, outputs your speed and distance traveled. It won’t display wind or depth data. Instruments that use the NMEA 2000 network don’t have these limitations. Essentially small multifunction displays, these networked instruments perform multiple marine instrument functions in a single unit and can be customized to your preferences to show just about any information from anywhere on your boat’s network. Raymarine’s i70, Garmin’s GMI 20 and Simrad’s IS40 are examples of these NMEA 2000 instruments. The GMI 20, which is pretty typical, shows depth, speed, wind and more than 100 marine and vessel parameters. Racing sailboats should have a complete integrated package, including boat speed, wind speed and direction, depth, and GPS data. Cruising sailboats can get by with less complete instrumentation, but skippers interested in performance will probably want to have at least boat speed, depth and wind information. Powerboats need to have boat speed and depth as well as the normal engine monitoring gauges, and may add wind information for voyaging or Race Committee duties. It’s nice to be able to monitor environmental conditions on a voyaging powerboat, since steering from a pilothouse or interior helm station makes it hard to determine the wind conditions. 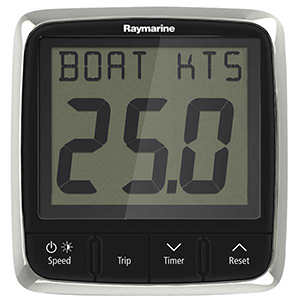 The Raymarine i50 Speed Instrument displays speed through water, speed over ground (GPS required), sea surface temperature, trip and log data. Monochrome or Color Display? What Size? The most affordable choice is a segmented monochrome display. Since you’re mainly looking at numbers on these single-purpose instruments, this inexpensive LCD display works fine. Fully networked instruments take advantage of this pictorial format to show you a huge selection of gauges, diagrams, very large and bright numbers—with NMEA 2000 networking, the sky’s the limit. When choosing an instrument system, consider how close you’ll be when reading the numbers. If you’re looking at mast-mounted instruments from the cockpit of a 40’ racing sailboat, you’re going to want bigger displays than if you’re reading a dash-mounted display on your 19’ Sea Ray. Look at B &G and Nexus for sail racing instruments for all sizes of boats. The availability of wireless connections for boat instruments eliminates the headaches associated with drilling holes in the deck or hull and routing cables up the mast. Micronet instruments talk to each other through a secure wireless network that does not interfere with other onboard systems and that does not transmit one boat’s data to another with the same system.